If my Wicked Witch last week felt a bit to plain for you, today's costume is grand enough to please any showboating costume connoisseur. Though this Egyptian mummy outfit seems very layered and complicated, all it really takes are 3 items and some eye-catching makeup layers. 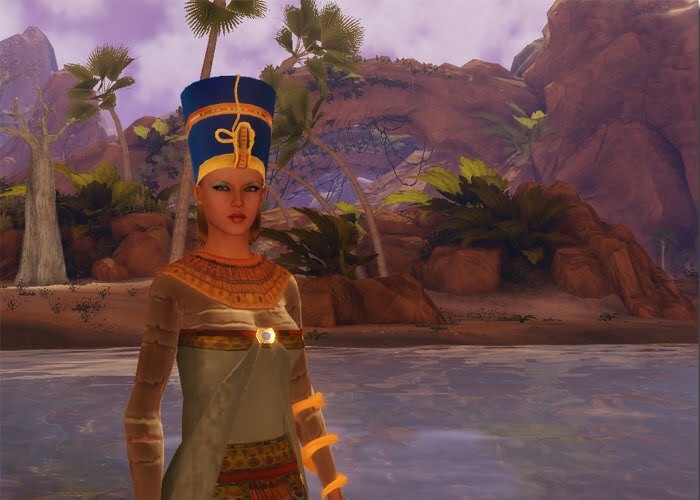 I've used Arcadia as a backdrop for this Egyptian queen, as the tropical trees, sand, scrubby vegetation, and glittering river are a perfect fit for this Valley of the Kings inspired ensemble. The main elements of this costume are the Pharaoh dress and crown from AD Sport in Beach City. The dress comes with all the ornaments including the golden coiled snake armband built in, and the crown comes with a sleek bit of blond hair attached so you don't have to worry about fitting any hairstyles underneath it. While I like having hair built into the very snug crown, I would have preferred the option of a black or dark brown color, given how rare blond Egyptians were compared to the brunettes. Nevertheless, the crown and the dress are a pretty spectacular work of creative modeling, as I've come to except from AD Sport's designs. Now you could leave the outfit at that and be done, but I've chosen to take it to the next level with a set of head-to-toe mummy wrappings from Costume Trends in Venezia. The detail and shading on these wrappings is an excellent compliment to the outfit from AD Sport. The final touch is the makeup. I've gone with a blue-green metallic eyeshadow with flared black kohl liner, and a neutral beige lip. If you're feeling more adventurous, try a bright red lip, or a more artful and elaborate eyeliner design. Think you can improve on this anciently awesome style? Submit your costume picture for 1000 BLU$, and don't forget to attend the Monster Mash Halloween party in the Welcome Area next Friday, October 29th, at 6PM PDT! I'll be there to find the cutest, coolest, and creepiest costumes. For more details on both, click here! Another very creative assembly of elements!